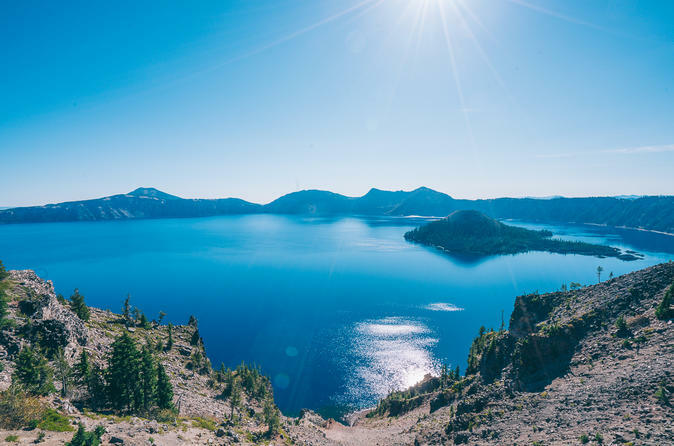 Embark on this 3-day excursion from Portland to Crater Lake National Park and back. Explore one of Oregon's beautiful State Parks and visit a vineyard to enjoy a wine tasting. Visit and explore Crater Lake National Park! Discover the magic of Oregon's history at the High Desert Museum, Smith Rock State Park, and Timberline Lodge. People call it the “crown jewel” of the Oregon State Parks system, and once you visit, you know why. Silver Falls State Park is the kind of standout scenic treasure that puts Oregon firmly onto the national—and international—stage. Its beauty, boundless recreational opportunities and historic presence keep it there. Nestled in the foothills of Oregon’s Cascade Mountains, less than an hour east of the state capital of Salem, the sprawling 9,200 acre property is the largest state park in Oregon, and one of the most popular. You will be able to check out the famous South Falls and see what a 177-foot curtain of water looks like from behind. We will also visit North Falls and you will be able to walk behind it! Lunch (on own) in Silverton, Oregon. As we drive to Crater Lake we will stop at Salt Creek Falls which is Oregon’s second highest single drop waterfall, cascading 286 feet (87m). (Multnomah Falls is the highest.) This waterfall is also one of Southern Oregon’s most powerful falls, with an average yearly flow of 50,000 gallons per minute surging over the rocks. Upon arrival at Crater Lake we will spend half the day visiting all the incredible vistas, visitor centers, overlooks & Historic Lodge. Crater Lake has inspired people for thousands of years with some of the 1st Native Americans who discovered it’s beauty and mystic. No place else on earth combines a deep, pure lake, so blue in color; steep surrounding cliffs almost two thousand feet high; two unique picturesque islands; and a violent volcanic past. It is a place of immeasurable beauty and the Nations deepest lake over 1,900 ft deep. This morning we will visit the High Desert Museum. This unique museum reveals the natural world and cultural history of the West’s High Desert region through artful exhibits, alluring animals, engaging programs and meaningful history. The Museum is feels like stepping into a different time and place. Next we will make a brief stop at Smith Rock State Park, which is one of the 7 Wonders of Oregon. Its towering rock spires have beckoned climbers from around the globe since the 1980’s. Next stop Timberline Lodge! You won’t see anything else like it, anywhere. Legendary, awe-inspiring, a tribute to the rugged spirit of the Pacific Northwest. Monumental lodging on Mt Hood with year round skiing. Declared a National Historic Landmark in 1977, Timberline Lodge is one of Oregon’s most popular tourist attractions, drawing nearly two million visitors every year.